Taste the miracles of the Moroccan traditional cooking ! 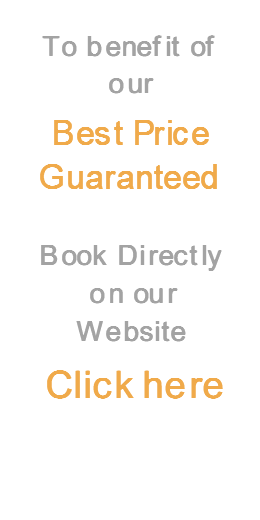 Riad Jonan proposes you delicious Moroccan specialities, couscous, meat stew in tajines (clay pot), Moroccan salads and other dishes all so delicious … A real culinary journey at the heart of the Moroccan gastronomy. Our full time cook will prepare a hearty breakfast for you with freshly squeezed orange juice, English tea or Coffee and a selection from Cereals, Fresh fruit plate, Eggs prepared to order, Home made Yoghurt, Moroccan crepes and a bread basket of Croissants, Brioche and local breads. 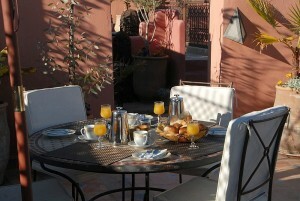 Breakfast is usually served in the courtyard around the fountain or may be served on the roof terrace. 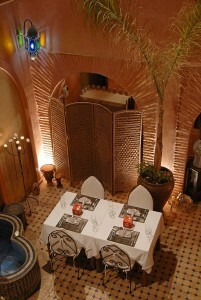 Eating at Riad Jonan is a Culinary experience not to be missed. Our resident cook has many years experience of Moroccan cooking, Many of her recipes have been passed down through her family. They say the best Moroccan meals are not in the restaurants but in their homes. Our cook will prepare a meal just for you. Cooked fresh on that day only using fresh ingredients bought from our local market. All our ingredients are organic. Hence why we need advance notice as the nature of Moroccan cooking takes several hours. A typical example of our three course dinner is: a mixture of vegetable salads lightly spiced with aromatic spices, Cinnamon, Cumin and Ginger served with warm local flat breads. The main course is a Tagine of your choice, Meat, Fish or vegetable spiced with ” Ras Hanout” a blend of 35 spices. The Tagine is served with a vegetable steamed Couscous topped with Caramelized Onions. To Finish, either Fresh Oranges sliced and dusted with Cinnamon and Dusting sugar or a light Pastry cake. Tea, coffee or Mint Tea with Moroccan pastries. The Tagine can be replaced if you wish by one of the most subtle recipes of the Moroccan cooking: the Pastilla. Two other menus will allow you to discover either our traditional Couscous with three meats subtly spiced or a Tagine with meat in a orange sauce blending sweet and salty tastes. 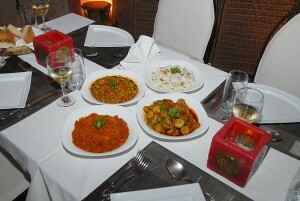 Many guests pre order this meal for their first night of arrival at the Riad. We are happy to make suggestions for some of the many restaurants in town. An average price at a good restaurant with wine is approx. 400 MAD p.p for three courses. 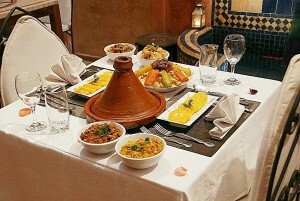 Marrakech has a huge choice of restaurants covering virtually all types of cuisine.